I have been wanting for some time now to do an illustrated piece that shows Vincent Starrett's longevity as a "coverboy," a name on the cover of a magazine that the publisher hopes will drive up sales. There won't be a lot of text, because I'm hoping the images will tell most of the story. Here goes. One more note: This is intended as a survey and is far from a complete list. It's not even all the magazines that have Starrett on the cover from my collection. Bed sheet magazines were normally 9X12 inches or so in size. Let's start with one of my favorite pulps, Real Detective. It started life in 1922 with the name Detective Tales, morphed to Real Detective Tales and Mystery Stories and eventually became simply Real Detective. Under the latter name, it ran at least through the 1970s. As the name implies, it went from largely detective fiction, to mixed content, settling on "real" stories for most of its later run. Starrett published several of his Jimmie Lavender stories here for the first time in the 1920s. But the magazine has a far greater importance for the friends of Sherlock Holmes. In December 1932, Starrett published in Real Detective one of the first chapters of what would soon become a Sherlockian classic, The Private Life of Sherlock Holmes. The story of this nascent chapter was published a few years back in The Baker Street Journal and is still available online. It was a fun bit of writing and I am pleased to say it won me the Morley-Montgomery Memorial Award, something I thought I would never be able to claim. It's one of the few times Starrett is included in a magazine that whose content was aimed primarily to women readers. 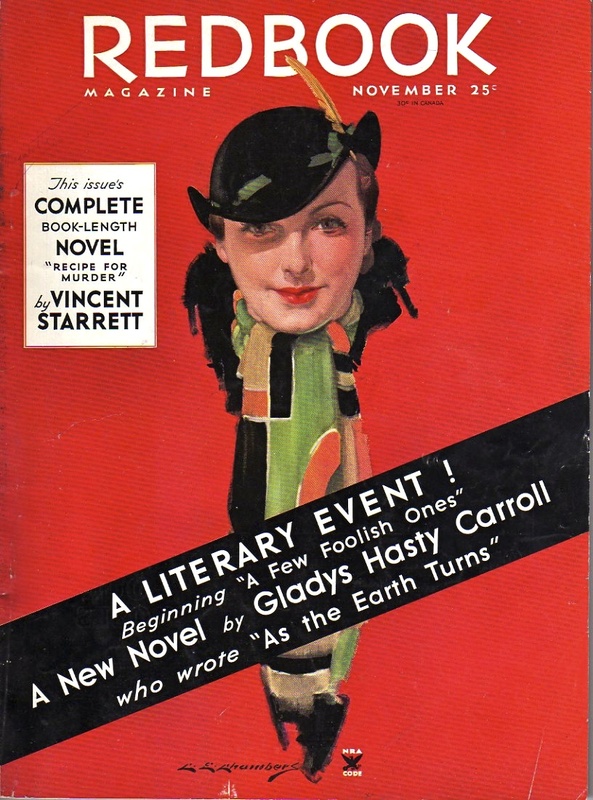 When Starrett appeared on the cover of Redbook in November, 1934, the magazine was already a venerable institution. Debuting in 1903 as The Red Book Magazine, the publication underwent several evolutions through decades, but its reputation as a place for solid short stories remained. The story does not star Jimmie Lavender, but Chicago drama critic Riley Blackwood. We'll next take a look at several digests. Ellery Queen's Mystery Magazine is the most venerable of the lot. Begun in the fall of 1941, this digest sized publication continues today, despite the vagaries of the mystery marketplace. Starrett was represented often in EQMM, in no small part because he was friendly with Frederic Dannay, one half of the team that created Ellery Queen. Dannay, a fellow BSI, served as editor-in-chief of the publication until his death in the early 1980s. Starrett's works published here were largely reprints of earlier stories. By the time EQMM came along, Starrett had largely given up writing fiction in favor of writing books about books. The range of Starrett's appearances show that even ofter his most active period ended, he was still considered a name that could draw a reader's eye. The first appearance I own is in the second number of EQMM from the Winter of 1942. The most recent is from an EQMM anthology from 1966. In between, you can see the magazine go through several incarnations. Almost all of Starrett's contributions here are reprints of his Jimmie Lavender short stories. Like its more popular and longer-lived brother, The Saint magazine was based on the adventures of a famous fictional detective, Leslie Charteris' Simon Templar, also known as The Saint. Begun in 1953, The Saint Detective Magazine ran until the late 1960s. Starrett had only one contribution to this magazine, so far as I can tell, but it was published in three different versions of the magazine: The American edition from October 1956; the British edition of May 1957; and the French version from December 1957. The story is "The Day of the Cripples," and is one of my favorites. It was supposedly a early idea which Starrett stuck away in a drawer and finished many years after it was conceived. And sharp-eyed readers will note that the Solar Pons stories of August Derleth also found a second life in the pages of The Saint Detective Magazine. The creator of Nero Wolfe had his own mystery digest magazine for a brief time in the mid 1940s. 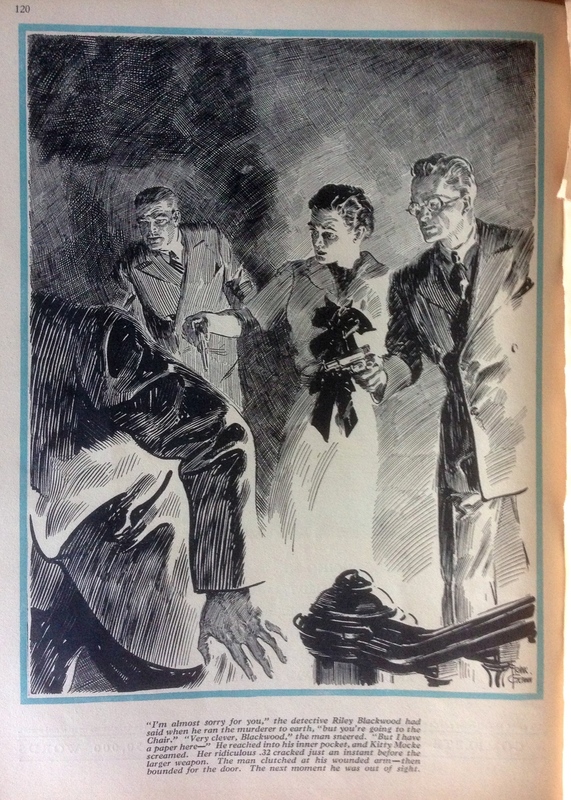 Featuring reprints of "classic" mysteries and an occasional new story, the digest failed to win a following and disappeared. It's name varied slightly during its brief life, but it started as Rex Stout Mystery Magazine. As fellow members of The Baker Street Irregulars, it is not surprising that Starrett should show up in a few of the Stout digests. Once again, these are reprints of much earlier stories featuring Chicago detective Jimmie Lavender.